JLC International is a global distributor of many different kinds of measurement devices from flowmeters to transmitters. 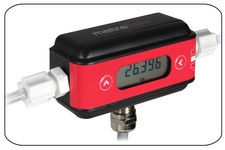 Included are flowmeters capable of measuring very low flow, down to 2 ml/min. Below are three meters that qualify as low flow as well as a totalizer to indicate total flow and flow rate. Accuracy that is better than ±1.0% of reading. The USB interface on two of the three versions permits the user to directly monitor the rate and total on their laptop while also altering some of the operating parameters, such as the pulse resolution and units. The Atrato system of low flow meters uses the well-proven time of flight measuring method, which is far more reliable and accurate than Doppler shift measurement, wherein, reflected signals are required from irregularities in the liquid. The strong radial ultrasonic signal sends symmetrical pulses directly into the tube; the sound travelling down the pipe can be considered as a plain wave. The signal to noise ratio is remarkable, as there is little background noise and high signal strengths. As the system is fully balanced at zero flows, the two signals are identical and cancel each other out. This gives a very stable zero flow condition and is the basis of the flowmeter’s high-ratio between minimum and maximum flows. As the flow increases, these signals go out of phase, and this phase shift is measured to an accuracy equivalent to 250 picoseconds. In addition, the sound waves travelling down the tube in the Atrato operating system are symmetrical, and as a result, any changes in the fluid’s velocity profile across the pipe diameter will be averaged out by the signal as it passes from the transmitter to the receiver. It is therefore irrelevant whether the fluid velocity profile is fully formed with turbulent flow or completely laminar with a classic parabolic profile. In practice, this gives the Atrato an excellent immunity to Reynolds number changes and a good high viscosity performance. The LMX low flow flowmeter is very different than any other turbine flow meter, like e.g. beverage flowmeters. The LMX series of low flow meters are manufactured from 316 stainless steel and provide accurate flow measurement down to 4 ml/min. The Pelton Wheel is a single size, straight bladed rotor, manufactured from chemically resistant PFA with sapphire bearings. These bearings run in hemispherical sapphire bearing cups, which form a “floating”, low friction, precise unit. Sealed ferrites are mounted within the tips of the rotor and are sensed by the pick-up sensor suitable for high pressures. The integral upstream/downstream straight lengths ensure the correct flow profile conducive with accurate measurement in the field. With the chemically-resistant materials of construction, combined with their ability to work with pressures up to 230 bar (3336 psi) and temperatures up to 100 °C (212 °F), the LMX series of low flow meters are suitable for most low flow applications. Those who are interested, are encouraged to contact JLC International by calling this number: 1-888-358-2518. We strive to assist you with any of your measurement needs in any variety of industry. Our low flow flowmeters can certainly provide you with an asset you won’t find elsewhere.